There are several factors which determine trading activity within the fine-wine market. The main factors include inventory level and market sentiment. The inventory level is a measure of the number of bottles of a particular fine wine available on the market while the market sentiment is a measure of how receptive the wine is at the demand side. At a more fundamental level, supply and demand governs the mechanics of the market. However, real supply and real demand are unobservables and this in itself raises an empirical challenge. To this end, WineQuant have developed a quantity called the WQ Inventory Value as an estimate for supply using trading data available from Liv-Ex. This WQ Inventory value is calculated based on two variables: the number of bottles of a particular wine available in one particular number and its monthly averaged traded price. In this blogpost, I shall present the WQ Inventory Value for two wines, Haut-Brion 2010 and Lynch-Bages 2010 between October 2012 and January 2016. There are two main reasons as to why these wines were chosen. Firstly, Haut-Brian 2010 and Lynch-Bages 2010 are two of the most highly-traded wines by value (as opposed to by volume) on the Liv-Ex platform. Secondly, while both wines are highly-traded on the platform, Lynch-Bages 2010 is the more actively traded between the two (details of trading activity will be discussed in a latter post). It is thus interesting to note differences and patterns in the WQ Inventory Values between these two wines. The first graph above shows the WQ Inventory Value for Lynch-Bages 2010 between October 2012 up until January 2016. There was a gradual build-up in inventory between October 2012 until March 2013, after which the inventory remained fairly high until a re-adjustment sometime in June 2014. We offer no direct explanation for inventory behaviour prior to 2015 but the values are displayed in order to show that long-term trading data are available and easily accessible. While it is true (to a limited extent) that long-term patterns and trends can be useful guidance, we note that it is more important to focus on recent trends, especially given the current bleak global economic outlook. There has been a gradual build-up in inventory in early 2015 before trading activity picked up to consume the stock available. The sharp decrease in inventory values in September 2016 merely reflects the lag in summer demand. The lag is attributed to the July/August market turmoil in Shanghai when the Public Bank of China (PBoC) tweaked the daily fix between the RMB and the USD. The gradual tweaks/depreciation/de-peggings are signatures of the PBoC’s aim of making the RMB a free-floating currency. 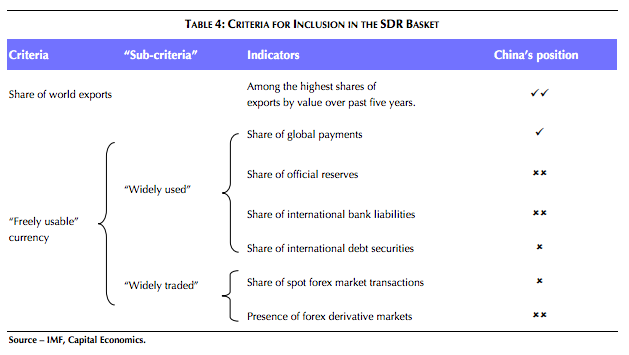 This will improve the chances of including the RMB inside the IMF’s basket of international currencies with special drawing rights (IMF-SDR), pending of course conditions which the RMB has yet to fulfil (see this). Yes, such disruptive effects do find their ways in into all types of markets – the fine-wine market included. This is further sign that the Chinese economy has a strong influence on the fine-wine market, alongside the US economy. We believe that Bordeaux wines are affected more strongly by the Chinese economy while Burgundies are affected more by the US economy but do not currently have the trading data to back this up convincingly yet. As a preliminary, you only need to ask Burgundian producers who their major export markets are. Trading activity for Lynch-Bages 2010 did continue to remain strong over the Christmas trading period (as predicted in a WQ report published back in November 2015) but this activity has slowed down in the past month (January 2016) for reasons which we are all now familiar with. There will be a gradual increase in inventory values over the coming month or two. We at WQ will re-visit this in the coming months. As a comparison to the WQ Inventory Value for Lynch-Bages 2010, the figure below shows the WQ Inventory Value for Haut-Brion 2010. WQ Inventory Value for Haut-Brion 2010 shows a wine whose inventory levels have been decreasing with time, except for an unexpected stock injection between May and June 2015. Such stock injections do reflect one alarming aspect with regards to wine supply in the fine-wine market. We know that there are easily tens of thousands of cases made for each classified growth Bordeaux out there every vintage (you can refer to Stephen Brook’s The Complete Bordeaux for more exact production numbers for each château). This begs the question where most of the wines have gone. Furthermore, the fact that it is possible to flood one marketplace – here the Liv-Ex platform – at any one time shows that supply can be somewhat irregular (this does not of course apply to every wine, so make sure you do your homework in advance!). Irregular supply can have serious repercussions on the demand side which we shall see in a later blogpost on trading activity. That’s that for today’s blogpost. Some of you may have noticed the change in tone of this blogpost but this is unavoidable as I am working into the meat of the tools which we have here at WQ. In the next post, I will discuss the market sentiment and an estimate developed by WQ to characterise this sentiment. Wine investing and trading III: Supply by WineQuant is licensed under a Creative Commons Attribution-NonCommercial-ShareAlike 4.0 International License.